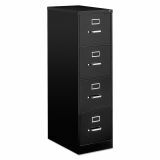 Alera 4-Drawer Economy Vertical Metal File Cabinet, Letter, 52" Height, Full-Suspension, Black - Ideal for long-term and archival storage. Wire follower block keeps files neatly in place and can be adjusted by repositioning block in guide holes. High-sided drawers accommodate hanging files without hang rails. Sturdy aluminum handle and thumb latch. Telescoping ball bearing suspension provides smooth movement with full drawer extension which allows easy access to materials inside. Core removable lock allows files to be keyed-alike.